The main dining room of the Tor Hotel in Kobe, Hyogo Prefecture. The Tor Hotel was located on the northern end of Kobe’s Tor Road, now the location of the Kobe Club. 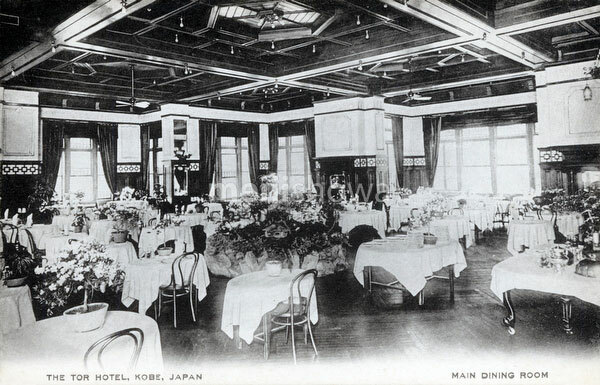 The hotel was built in 1908 (Meiji 41) because the popular Oriental Hotel near the port was overcrowded each time passenger ships arrived. The hotel received its name from it location, a rocky hill or “tor”. Soon people started to call the road leading to it “Tor road.” The hotel burned down shortly after the end of WWII, but the road has kept its name.